Italian luxury brand Dolce & Gabbana have just added another pair of glasses to their exclusive Gold Edition line, launched last year for their Spring/Summer collection. Inspired by classic 1950’s style, and designed in tribute to the 20th anniversary of their menswear collection, D&G have resurrected these Rayban Clubmaster-inspired glasses with square or circular frames. In either tortoiseshell or black, the frames come wing tipped with 18 carat gold. Each pair of Gold Edition sunglasses also comes within its own jewelry case, portable black leather carrier and certificate of authenticity. 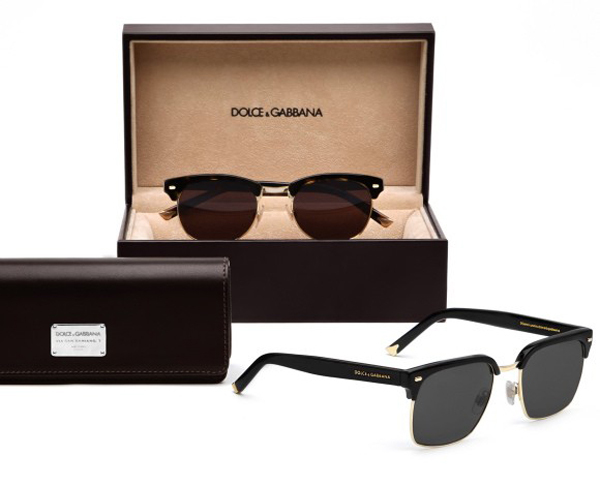 These retail for about $500 at luxury sunglass boutiques, except for the square version which will be sold exclusively through Dolce & Gabbana brick and mortars.